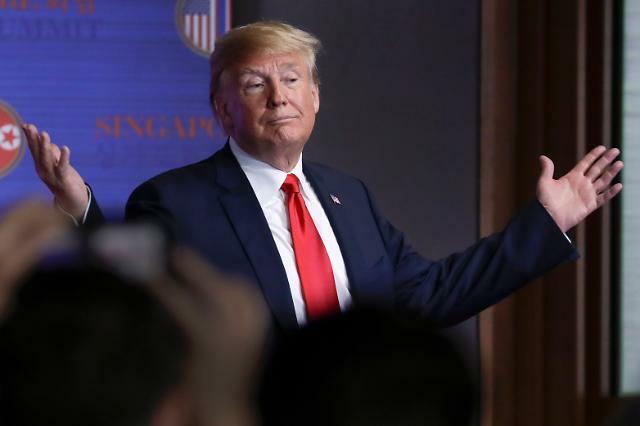 SINGAPORE -- In an apparent reward for North Korea's denuclearization, U.S. President Donald Trump said Tuesday that he would consider stopping "provocative and expensive" joint military exercises with South Korea in remarks that could lead to a possible change in the security landscape of Northeast Asia. There has been speculation that Trump and Kim might discuss the fate of American troops stationed in South Korea and their joint drills with South Korean troops that have often raised cross-border tensions. "We will be stopping the wargames which will save us a tremendous amount of money, unless and until that we see future negotiation is not going along like it should," Trump told reporters after signing a peace accord with North Korean leader Kim Jong-Un at their summit in Singapore. "We will be saving a tremendous amount of money. Plus I think that it is very provocative," the American leader said when asked about what security assurances he can give. There are about 28,000 US troops stationed in South Korea. Washington and Seoul insist their joint military exercises are purely defensive in nature, but Pyongyang has condemned them as provocative rehearsals for an attack on the nuclear-armed country. Suspending joint war games is a sensitive issue in South Korea where conservative groups support a strong security alliance between the two traditional allies as the centerpiece of deterrence against any aggression. 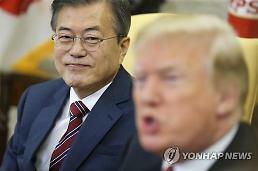 The withdrawal of U.S. troops from South Korea has been North Korea's long-standing demand and Trump indicated the issue could be discussed in the future if relations between Pyongyang and Washington improve further. "I used to say this during my campaign. I want to get our soldiers out. I want to bring our soldiers back home. But it's not part of the equation right now. At some point I hope it will be but not right now." Trump praised Kim for taking the "first bold step toward a bright new future for his people" and said the unprecedented summit proves that "real change is indeed possible." "We are prepared to start a new history and we are ready to write a new chapter between our nations," he said, adding Kim would be remembered as a leader who ushered in a "glorious new era of security and prosperity for his people." The joint statement signed by the two leaders did not mention consistent U.S. demands for complete, verifiable and irreversible denuclearization (CVID), sparking speculation that Trump and Kim revealed differences over how to achieve denuclearization. CVID has been Washington's goal, and U.S. Secretary of State Mike Pompeo has said that the United States would make sure to verify any dismantlement of North Korea's nuclear program. However, Trump said the statement confirmed Kim's "unwavering commitment" to complete denuclearization. 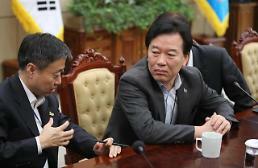 "We also agreed to vigorous negotiations to implement the agreement as soon as possible. And he wants to do that." In a related move, North Korea is already destroying a major missile engine testing site, Trump said. "That's a big thing. 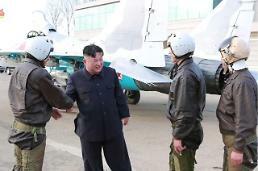 The missiles they were testing, the site is going to be destroyed very soon." "There's no limit to what North Korea can achieve when it gives up its nuclear weapons and embraces commerce and engagement with the rest of the world. And it really wants to engage." Trump called for a patient approach, suggesting it takes a long time to pull off complete denuclearization. Definitely, he wants to see significant improvement in denuclearization before removing sanctions. "The sanctions will come off when we are sure that nukes are no longer a factor. Sanctions played a big role but they will come off at that point. Sanctions will now remain but at a certain point I actually look forward to taking them off," he said. In their joint statement, the two countries agreed to work together on building a "lasting and robust peace regime" on the peninsula, which remains divided by the world's last remaining Cold War frontier. At an inter-Korean summit in April, Kim and South Korean President Moon Jae-in agreed to end hostilities and push for a peace treaty that would end the status of war on the peninsula and replace a fragile armistice signed at the end of the 1950-53 Korean War. For many people abroad, the Korean War has been forgotten, the armistice agreement is still in effect. "Yet while the armistice was agreed, the war never ended to this day. But now we can hope that it will soon end. And it will. It will soon end," Trump said. To convert the armistice into a peace treaty, the two leaders agreed to push for three-way talks involving the two Koreas and the United States or a four-way meeting involving the two Koreas, China and the United States. South Korea was not a signatory to the armistice agreement. The two countries will resume their stalled work to recover the remains of American soldiers killed or missing during the inter-Korean conflict. "It will be discussed in North Korea. 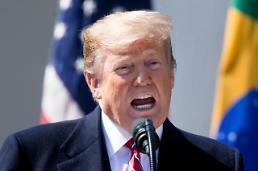 The remains will be coming back from North Korea," Trump said, adding Kim agreed to send the remains to the United States. This story was contributed by reporter Park Sae-jin and Jazin Wee, an editorial assistant.